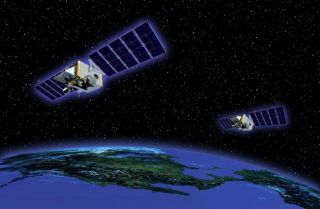 An artist's illustration of the new STSS missile defense demonstration satellites in orbit. The Missile Defense Agency says it is merging its $1.7 billion STSS tracking satellite mission with ground- and sea-based interceptor tests, a campaign officials hope will enable the military to launch kill vehicles against missiles before they fly in range of conventional radars. If proven, the ability to detect and track missiles from space will give commanders another tool to go along with sensors based on land, at sea and in the air. The addition of a space-based detection network, which STSS is designed to demonstrate, could give strategic, regional and theater defense systems more warning of an enemy missile and permit the launch of interceptors against the threat earlier than ever before. Existing radars and tracking systems, including the mobile sea-based X-band radar platform, can only see missiles and warheads in a limited area, usually in the launch or re-entry phases of flight. The STSS mission is supposed to show officials if satellites can provide a global perspective on missile flights. "STSS brings unique capabilities to missile defense," said Doug Young, vice president of missile defense and warning programs at Northrop Grumman Corp., which built the satellites. "It's the only system capable of tracking ballistic missiles through all phases of flight, starting with boost extending through midcourse and terminal phases." The United Launch Alliance Delta II rocket with Space Tracking and Surveillance System - Demonstrator, or STSS-Demo, spacecraft aboard races into the sky leaving a trail of fire and smoke after liftoff from Launch Pad 17-B at Cape Canaveral Air Force Station. After overcoming technical problems in the months after their September 2009 launch, the MDA's two Space Tracking and Surveillance System satellites detected and tracked a half-dozen U.S. missile tests last year. "In 2010, the satellites demonstrated many capabilities essential to performing their missile defense role in initial exercises, such as tracking U.S. missile test launches," Young said in a Northrop Grumman press release in January. "While those were not operational tests, they point to the potential applications of this satellite technology." A tracking instrument sensitive in infrared and visible wavelengths is designed to swivel and follow the missile in its midcourse phase of flight, when dim targets are difficult to resolve against the cold background of space. Both sensors were manufactured by Raytheon Co. In a missile attack scenario, the acquisition sensor would first detect a missile launch, then it would hand over responsibility to the tracking sensor, which would slew and point to the target as it flew through space. The Air Force operates a fleet of Defense Support Program infrared early warning satellites in geosynchronous orbit 22,300 miles above Earth, but those platforms are only designed to spot the fiery plumes of a missile blasting off. The STSS program was originally part of the DSP follow-on program known as the Space-Based Infrared System, or SBIRS, and the MDA took over control of the low Earth orbit portion of the project in 2001 and renamed it. Each STSS satellite is about the size of a compact car. They are controlled from MDA's operations center at Schriever Air Force Base, Colo. The STSS demonstration satellites were conceived to quickly identify launches and track warheads as they coast through space, providing a unique vantage point to collect data on their trajectories to be fed into interceptor control systems. According to Debra Christman, an MDA spokesperson, engineers have finished calibrating both sensor systems, established stable two-way communications between the satellites and tested a 3D stereo tracking capability in which the spacecraft follow a target in tandem. The radio crosslink between the STSS satellites allows the craft to transmit data to each other, expediting the identification and confirmation of missile threats. A Terminal High Altitude Area Defense (THAAD) interceptor missile is launched from the Pacific Missile Range Facility off the island of Kauai, Hawaii, during an intercept test, June 28, 2010. The stereo tracking milestone was accomplished Dec. 9, according to the MDA. Each milestone moves the satellites closer to being ready to play a more active role in missile defense tests, eventually leading to increased reliance on STSS data in commanding interceptor launches. "The STSS demonstration satellites will be integrated into MDA's overall testing strategy that calls for multiple missile defense elements to participate in each test event," the Northrop Grumman press release said. The agency has used the STSS satellites to track at least six targets since June, including ground-based interceptor, terminal area defense, airborne laser, Aegis missile and Minuteman readiness tests. The satellites tracked a Minuteman 3 missile test in September through the boost and post-boost phases, demonstrating their ability to follow a cold-body object through space, according to Northrop Grumman. Some of the observed missile tests served as "capstone" exercises to demonstrate proper calibration and sensitivity for the STSS satellites to pass on to the next milestone, the MDA told Spaceflight Now. Other sensor calibration milestones occurred while tracking missile surrogates such as the ground-based Starfire laser and a NOAA weather satellite. The next objective for the MDA satellites is to participate in live-fire exercise with the sea-based Aegis Ballistic Missile Defense System, which uses Navy ships equipped with SM-3 interceptors. The demonstration, called a launch-on-remote exercise, is scheduled for late 2012 or 2013, according to the MDA. The STSS satellites will be connected to the missile defense system's command network, which will issue the order to launch the SM-3 interceptor. "The objective of the Aegis launch-on-remote campaign is to provide a real-time cue from STSS to Aegis with sufficient quality to allow an Aegis SM-3 to launch on a target before it is in view of the ship," Christman told Spaceflight Now in a written response to questions. The agency spokesperson said the target missile for the Aegis live-fire exercise will be determined at a later date. The STSS satellites are already observing Aegis missile tests to prepare for the live-fire "graduation" exercise. More risk reduction exercises, including missile launches, are planned in the first half of 2011. The launch-on-remote concept was demonstrated in a laboratory in August, according to Army Lt. Gen. Patrick O'Reilly, director of the MDA. The tandem demonstration satellites were launched four months after the STSS advanced technology risk reduction, or STSS-ATRR, spacecraft was shot into orbit. The MDA has closely guarded specifics of the STSS-ATRR mission, other than saying it "demonstrated required on-orbit system performance parameters for a prototype sensor technology." The MDA is transfring control of the STSS-ATRR satellite to Air Force Space Command to continue operating in a Space Situational Awareness mission tracking other satellites in orbit. The agency hopes the STSS program will set the stage for the Precision Tracking Space System, a network of between 9 and 12 satellites to join operational MDA assets in real-world defense efforts. The PTSS satellite fleet would be used by sea- and U.S.-based interceptors and future missile defense deployments in Europe. A PTSS preliminary design review is scheduled for this year, O'Reilly said in December testimony before the House Armed Services Committee. O'Reilly said the agency will select five contractor teams to participate in prototype PTSS development, then the MDA will choose a single team for system production. According to Christman, the MDA expects to release a competitive request for proposals for the PTSS satellites by 2013. O'Reilly said the agency would select a prime contractor in 2014. MDA officials declined interviews on PTSS until after the White House releases its fiscal year 2012 budget request on Monday (Feb. 14).